Four Hour Raku Firing: Approx. 36 pieces fired, up to 12 participants for each four-hour firing. District Clay Fee: $500 includes on-site instruction, glazes, portable kilns and firings. Ceramic ware for firing can be included at an additional cost*. Raku firings are the most dramatic form of ceramic firing. They involve quickly heating bisqued pots in outdoor kilns to 1,800 degrees, then plunging the red-hot pots into trash cans that are filled with combustible materials. The trash cans burst into flame and smoke, which is quickly smothered. This type of extreme firing, created in Japan centuries ago, yields some of the most dramatic glazed surfaces in the ceramic repertoire, including iridescent greens and reds and white on black crackle glazes. 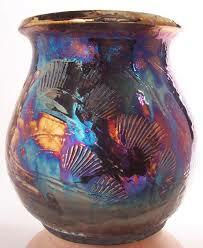 Raku is not only exciting to create but it is also a masterclass in how ceramic glazes are created. Raku firing utilizes both oxidation and reduction firings to create its dramatic surfaces with different stages in reduction firing turning the same glaze from an iridescent green to red. Ray’s Raku firings are highly interactive and hands-on. Students are carefully trained how to retrieve hot ware from the raku kiln using tongs and fireproof gloves and deposit it in reduction cans. Students also monitor reduction cans, fill them with sawdust and learn to smother the fire at the precise time. Once the ware has cooled, students will then scrub their pots of the charcoal and smoke residue to reveal the amazing colors underneath. Because firings involve handling of extremely hot ceramic ware and monitoring reduction cans which emit fire and smoke, raku firings present inherent dangers. Students or the participating entity must sign a waiver of responsibility before the firing begins. Ray’s Raku kilns are made from trashcans lined with ceramic fiber which makes them highly efficient and portable. Each kiln holds 3-8 pieces depending upon the size of the work. Along with the kilns Ray utilizes 6-8 small "reduction" cans filled with sawdust where pieces are placed when removed hot from the kiln. Each kiln load typically takes about 30 mins to reach 1800 degrees and the pieces are ready to be pulled. When doing workshops Ray uses two kilns and times them so they reach temp about 15 mins apart. This allows many kiln loads to be fired in a short time. Ray has been working clay for over 30 years and with Raku and other Alternative Firing Techniques for over 20 years. Since his first exposure to Raku firing, he has grown to enjoy the interactiveness and spontaneity of the technique and the uniqueness of each piece. He specializes with Naked Raku and Pit Firing techniques, conducts workshops throughout the Washington DC area, and teaches pottery for the Community College of Southern Maryland and at the Annmarie Sculpture Garden & Art Center. 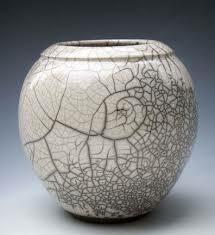 To schedule a District Clay Raku Firing Workshop at Your Place, click here.